The possibility to apply a Swing Look and Feel on the UI has been externalized. You can apply any Look and Feel you want, its name will be mentioned in the command-line, or in the shortcut properties. That brings more flexibility to the user, and cuts the dependencies with the providers. On the right is an example of what's possible, using the "Napkin" Look and Feel. The default look and feel is the System one, not the Metal one (Java default). Those who have already installed the program should re-install it, as some modifications in the launching script were made. There is now an option to display the data at the mouse in a transparent window of top of the chart, rather than using the regular tooltip bubble. 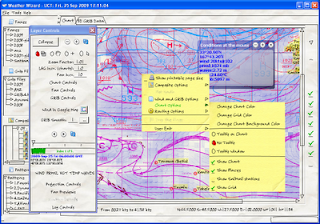 The window can be moved within the chart boundaries just like any other window. It can also be resized, the font size follows the window's size. There is also a new address to download the software, at http://weather.lediouris.net.